English Rugby Union champions Saracens are adding their considerable weight and sense of fun to Harrogate Water’s recycling message. 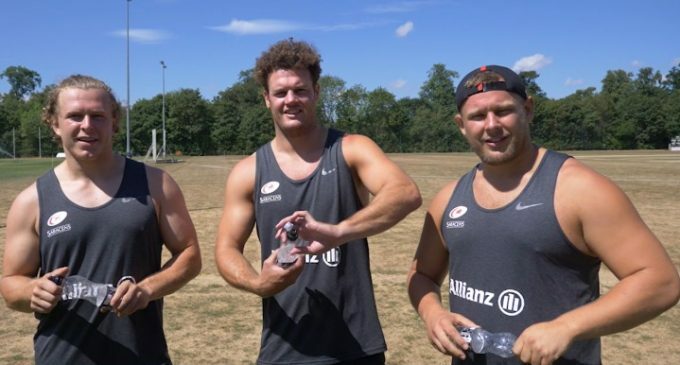 Saracens are staying hydrated in defence of their Premiership title with Harrogate Spring Water – whose PET bottles are made using more than 50 per cent recycled content. The partnership will include humorous social media video activity featuring players playing a game of flipping bottles but with a serious message about recycling. Harrogate Water marketing manager Erin Boswell says: “We are thrilled to become ‘Preferred Water Supplier’ to Saracens, one of rugby world’s greatest clubs. Healthy hydration in elite sport is essential for peak performance, something for which Saracens are renowned in the Premiership and European Champions Cup. Having professional rugby stars joining our online recycling campaign is a real boost for our latest recycling initiative. We are also proud to be using more than 50 per cent recycled content, the highest use of UK post-consumer recycled PET of any water producer.